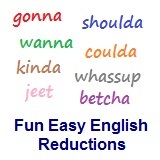 ﻿ Fun Easy English - new-american-english-reductions-reduced-words-topic-word-me-give-me-gimme. In this lesson you will learn the American English reduction gimme. Gimme a good reason to invite you to the party. Gimme more of the fried potatoes. Gimme a lot of the sauce. Gimme your thoughts about my new girlfriend. This reduction is used a lot especially with kids in America. Can you gimme something to eat now? Reductions, such as gimme are not real words in English. Hi again. What could be more fun than learning English language reductions from your favorite songs and TV shows? Listen to the way English speakers use reductions in the following videos. Enjoy. Britney Jean Spears (born December 2, 1981) is an American singer, songwriter, dancer, and actress. Born in McComb, Mississippi and raised in Kentwood, Louisiana, she appeared in stage productions and television series, before signing with Jive Records in 1997. Spears's first two studio albums, ...Baby One More Time (1999) and Oops!... I Did It Again (2000), were global successes and made her the best-selling teenage artist of all-time. Referred to as the "Princess of Pop", Spears was credited with influencing the revival of teen pop during the late 1990s and early 2000s. This video is a good example of the usage of "gimme", and "gonna" English language reductions.